Martin started diving in 2000 and has done everything he could to be in or around the water ever since. He started working part time at a shop in 2001 as a cylinder filler and retail employee. 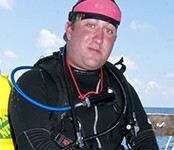 In 2006 he started working diving retail full time and later that year we certified as a PADI Divemaster. 2009 saw him certified as a PADI Instructor. Diving has offered Martin with many different opportunities from wrecks from WW2 and more recent off NC and Florida, fabulous coral reefs in the Florida Keys, Mexico, Caymans and Bahamas. The chance to live in Hawaii and play dive guide to people on week long dive trips aboard the Kona Aggressor. As well as dive in local quarries teaching SCUBA or local harbors working on people’s boats. Martin has also attained some Technical diving certifications which has taken him to the caves in Florida and the deeper wrecks off of Pensacola. Through it all he finds these days he is happiest either teaching new and experienced dives courses, or 60 ft down on a reef with a camera in his hands.